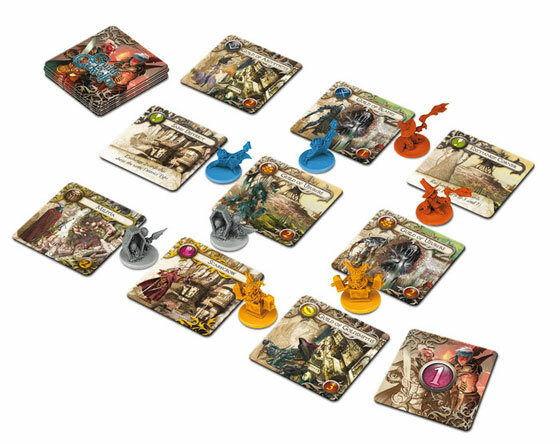 Guilds of Cadwallon is a fast tactical board game for 2 to 4 players. Take control of the famous City of Thieves set in the Confrontation universe! Brought to you by the publishers of the Kickstarter projects Zombicide and Sedition Wars! Each game lasts about a half hour, and is very easy to learn but hard to master. The object of the game is to accumulate as many Guild Points as possible by controlling districts of the city using your agents, on a randomized 3 x 3 square representation of the city over several rounds. Guilds of Cadwallon is a light-hearted worker placement / strategy game with a fantasy theme. I went in on the Kickstarter as I am a great fan of Rackham, and Cool Mini or Not tends to produce good quality games so this review is of the Kickstarter edition with the few extra bits that came as stretch goals. The difference between this is that the amount of cards for the ks edition is doubled, and there are 4 additional sets of pawns (different sculpts in 4 new colours), so it can be played by up to 8 players, or on a bigger play area. As I mentioned, the game is set in Cadwallon, the Free City (or City of Thieves) in the world of Confrontation and Rag-Narok created by Rackham. I’m not sure if the game was created and then the theme pulled over it or if the game was made specifically for this setting, but they fit well together. Cadwallon is meant to be the one free city on the world of Aarklash where nations live together more or less in peace (well, compared to the war going on outside the walls of the city, that is). People are organised in Guilds and these Guilds fight each other for wealth, prestige and to gain more control of the city. It is an ideal setting for role playing (which is what it was created for), but the simple diceless mechanics of this game seem to work well with it too (opposed to the other board/card games created for this franchise which ended up being completely based on luck, thus trumping all over the supposed intrigue and power play), although not as well represented as it is in Lords of Waterdeep. The personality cards are well known characters of Cadwallon RPG and Confrontation so fans will be happy to see the familiar faces – if not a little disappointed to see the exact same faces again. Also, having played Cadwallon back in the day I have to say the Guilds are a little off, but this will likely not bother anyone and does not let the game down. This was a little bit of a let down for me, and the reason for the game rating going down to 6 instead of 7. Having seen Zombicide and the rendered pictures of the pawns (same as on the box and in the official description above) I got very excited. The game uses the little ‘familiar’ models from the Confrontation Game and are shown in vibrant colours. These colours are represented on the cards too. Unfortunately the pawns themselves turned out to be completely different. All the colours seem faded compared to the renders, and I don’t mean it in the usual ‘screen-to-irl’ difference. The blue is very pale, the red is non existent, the orange is maroon, the yellow also looks pale, the gray is black, etc… Not only it is difficult to differentiate between some colours (not much of a problem for the pawns, but it is for the plain flat tokens) but also impossible to relate to the colours on the cards. Again, this is not really game changing, but it definitely ruined my excitement. The cards are nicely printed, but very flimsy. And some of the rule cards have typos on them which is again a bit annoying. The rulebook is small and well laid out, but has quite a few typos. Overall it seems CMoN tried to save on proofing of all the products and got unlucky. The box is small which is a good thing, but it is only split to 2 sections inside so you will need to keep your zip bags to keep things organised. Luckily I managed to fit all the free kickstarter extras in the box all right, but if you ordered any more add ons you will need a bigger box. This was also available (along with a game board) from CMoN during the KS campaign. Guilds of Cadwallon is played on a 3×3-5×5 grid of cards placed on the table. There is no need for a game board, but the optional one avalible during the KS campaign is very nice and could improve game experience. Cards have certain characteristics, depending on what kind of cards they are. Guild cards have guild points and support values, militia cards have ‘negative’ support values, personalities and actions have special effects. The spaces between cards are called boulevards and this is where players place their pawns. The pawns get ‘support’ from adjacent cards on their opposite side and the highest total wins. The object of the game is to capture cards with pawns in a top-trumps kinda way played on this matrix. Captured cards go to the players and get replaced by new ones from the deck. This is very easy to understand after only one played round. An extra twist comes in with personalities and action cards. These can change the way totals are calculated or swap cards on the table, changing the support pawns get. Very easy to get the hang of it and a lot of fun trying to constantly thwart your opponents’ plan to capture certain cards. The game ends when you have not got enough cards left in the deck to replace all the captured cards on board. At this point players add up the total guild points of their captured cards, add any bonuses, and the highest total wins the game, having acquired the most influence over the Free City. Easy to learn and you can dish out a couple of games in an hour which makes this a very good filler game. I can imagine this game getting boring after some time and thus should not be played as the main game. I would compare it to a card game like UNO which you play around for an hour or two if you have nothing better to do, or just have a quick go at it between two bigger games for a change. As a filler game it is great though, and will keep you entertained on those occasions when you haven’t got the time for a big game for years to come. I was trying not to compare this to Lords of Waterdeep too much but it is difficult to avoid considering that both of them are euro-games in an RPG’s skin. Luckily the nature of these games is different; while Lords of Waterdeep is a more complex game with more options and longer play, Guilds of Cadwallon is a very simple little game with few components in a small box. Considering the low price I think it is a good buy if you can get over the colours of the game pieces. The small box will not take up much space in your game cupboard so you won’t mind it sitting there for longer between two games, and if you like the artwork of Cadwallon/Confrontation and these kind of games, you will be happy to have it in your collection. On the other hand, if you’re looking for a more serious game with more involved mechanics, this is not for you. I will try to sound more informative than harsh, but it will be hard for me to hide that this is my least favorite game from my 200+ collection. Guilds of Cadwallon cycles through a few rounds of flipping over District Tiles, placing agents, and collecting points. For the most part, that’s it. The rulebook comes packed full of Lore, from the Guilds to the setting; however, sadly, this lore is useless. Never in the game does any of the theme have any purpose at all, which is sad, because the theme is cool. The game could be numbers on cards and nickels for markers and the gameplay would feel the same. Simply put, there really is no strategy in this game. Every turn, there is a calculable best play. That just takes a little thinking. There is no strategy to that. Also, there is a very clear start player advantage, because they get the first chance to take that obvious best placement. The worst part about the start player advantage is that, with the way the game plays, it’s possible that not every player will have the chance to go first. In a game my group played with 4 players, I was the last player in the first round and the game ended before I got a chance to take the start player position. I lost big time. The art is cool and the theme is cool, even though it is sadly not applied. Those are the only good things I can say about this game. Add a Review for "Guilds of Cadwallon"